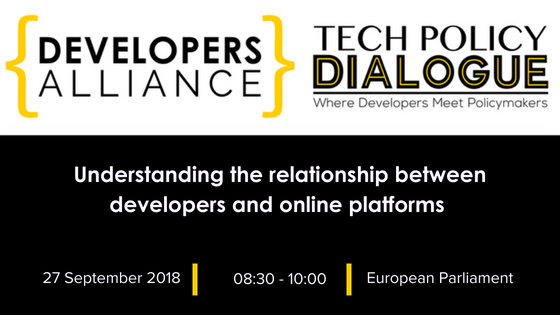 Join the upcoming Developers Alliance’s Tech Policy Dialogue on "Understanding the relationship between developers and online platforms" and be part of the discussion on the level of competition in the mobile app ecosystem and on the relationship between developers and online platforms. This breakfast session, kindly hosted by MEP Eva Kaili, will be held on Thursday 27 September 2018, in the European Parliament. The event will bring together high-level participants from the EU Institutions and representatives from the industry and the developers community for a highly interactive debate. The focus of the debate will be on how policy-makers can encourage improvements and best practices in the relation between platforms and their business users, while avoiding unintended consequences on smaller players. Seats are very limited and assigned on a first come, first served basis. Ensure your participation by registering as soon as possible.